O'Rourke is countering with the opposite. He's blowing off the Democratic Party's political luminaries and instead cranking up the cool — rocking with Willie Nelson, securing shout-outs from star rappers and road-tripping with a 38-year-old Kennedy whose family name still has its mystique. While their approaches seem divergent, both candidates are opting to sacrifice one goal to accomplish another. They're trying to fire up the loyalists they see as key to victory, even if it means slighting moderates and undecided voters — energizing the right and the left while ignoring the middle. "There's a common misconception that elections are mostly decided by so-called 'swing voters,'" O'Rourke's campaign wrote in its "Plan to Win." Cruz has for months noted that there are more Texas Republicans than Democrats, so if he guards against conservative complacency, he wins. Both may be onto something. 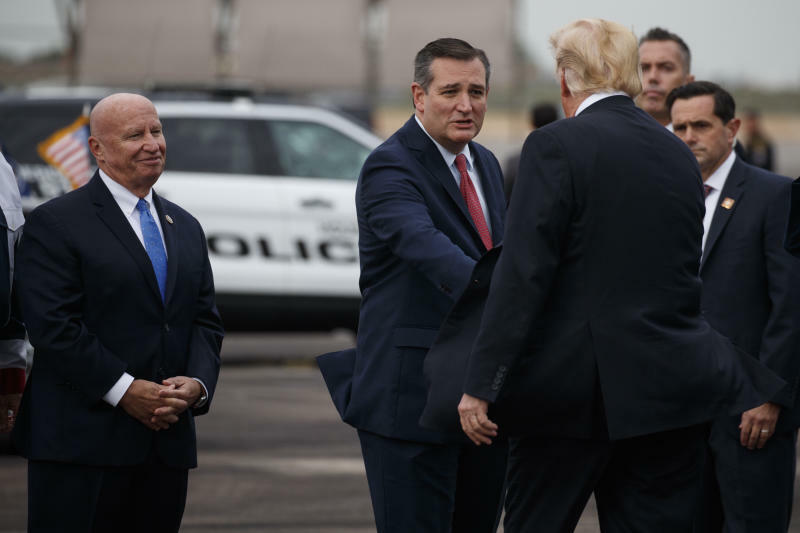 A recent Quinnipiac University poll that showed Cruz leading the race by 9 points also found that, among likely Texas voters who could name a Senate candidate, 96 percent had made up their minds. "There are many of us who argue there is no middle and there are no swing voters left," said Texas Democratic consultant Colin Strother. O'Rourke hasn't completely written off non-Democratic voters, trumpeting bipartisanship at rallies. But he hasn't softened a platform of universal health care, gun control, decriminalizing marijuana and offering a $10,000-per-child federal grant for pre-kindergarten. "Beto is saying, 'Hey look, you're all welcome here, but this is what I believe,'" Strother said. After spending months hitting rural corners of the state that other Democrats gave up on decades ago, O'Rourke is now largely sticking to reliably blue venues such as college campuses, a Willie Nelson concert in Austin, a Houston show featuring rapper Bun B, Texas-Mexico border concerts and rallies and a Dallas sunrise jog. The recent Austin City Limits festival was so choked with "Beto for Texas" T-shirts that it sometimes seemed the lanky Senate hopeful was headlining along with Metallica. And as R&B star Khalid won an American Music Award this month, he declared from the stage, "Shout-out to Beto." "He's representing everyone and not just a certain group of people," said 18-year-old Anoosha Adtani, who joined a line of students snaking out the door when O'Rourke appeared at the University of Texas at San Antonio. Not on the schedule are ex-Vice President Joe Biden and former Secretary of State John Kerry, though they've pitched in on Democratic campaigns elsewhere. 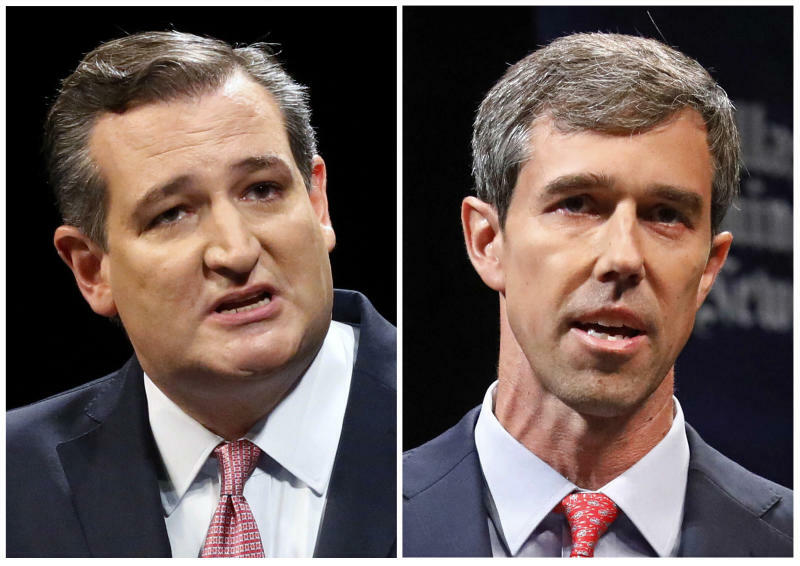 Liberal powerhouses like Sanders, Massachusetts Sen. Elizabeth Warren and Alexandria Ocasio-Cortez also haven't stumped for O'Rourke. Instead, he's brought in Massachusetts Rep. Joe Kennedy III, who is enough of a greenhorn nationally that Cruz has made fun of him, laughing about how Kennedy drove O'Rourke between events and saying, "It may be the first time in history anyone's ever asked a Kennedy to drive." That raised in peoples' minds the deadly, 1969 car crash on Chappaquiddick Island involving Sen. Ted Kennedy, Joe's great-uncle. With his party controlling the White House and Congress, Cruz now touts a Republican status quo he attempted to torch as a tea party firebrand. In addition to the Trump administration's top brass, fellow Texan John Cornyn, the Senate's No. 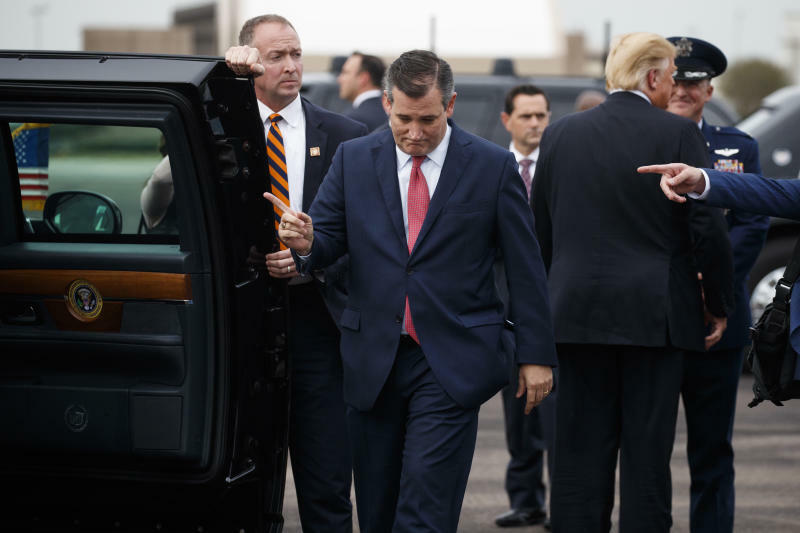 2 Republican, hosted a Washington fundraiser for Cruz despite their past policy clashes. Fox News host Sean Hannity and ex-Texas Gov. Rick Perry, now President Donald Trump's secretary of energy, also campaigned for him this weekend. Still, George W. Bush lives in Dallas but isn't hitting the trail on Cruz's behalf, underscoring how he'd rather have Trump supporters than traditional, country-club Republicans. A three-term El Paso congressman, O'Rourke has stayed within striking distance despite his party not winning any of Texas' nearly 30 statewide offices for almost 25 years. His crunch-time strategy is to mobilize 5.5 million people who "are very likely to vote for Beto if they vote, but who might not vote unless we contact them." That means prioritizing those who moved to Texas from other states and often settled in urban areas, and millennials who are "the most diverse, most progressive generation in American history," according to his playbook. Chairman James Dickey said the Republican Party of Texas has been similarly contacting new and past sympathetic voters for months, not just in the race's final weeks. "We have a very clear process that has worked very well," Dickey said. Texas added 1.6-plus million registered voters since 2014's midterm elections, with young voters helping to power that surge. But Austin Republican analyst Derek Ryan noted that four years ago, only about 14 percent of the newly registered voters under 20 wound up casting ballots. O'Rourke, though, insists that courting youth is no fool's errand. "Young people have been coming out to our events in record numbers," he said after the San Antonio event. "I'm going where the leaders are."